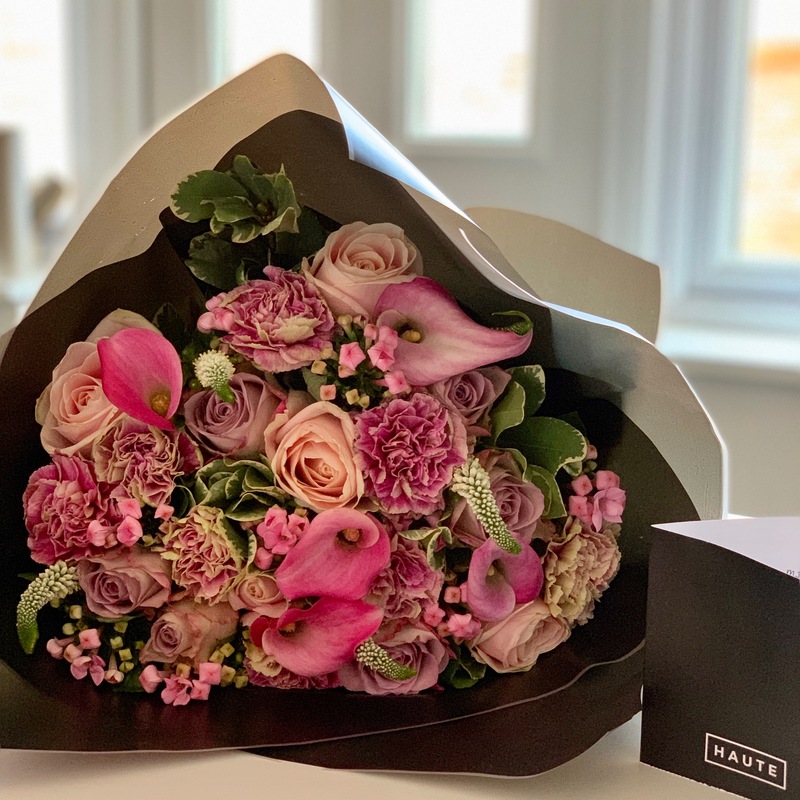 I was over the moon to receive a Mother’s Day bouquet from Haute Florist to review. We haven’t had fresh flowers in our home for a while and I’ve been missing them. Flowers always cheer me up! Haute Florist is an online florist that ethically sources flowers from all over the world. They offer a wide range of beautiful bouquets, luxurious hat boxes and special occasion flowers. They also offer next day delivery. I had no idea which bouquet I would receive but they all looked gorgeous on the website, so I didn’t really mind. When the delivery man arrived, he handed me the box and said, “Oooh, I think they’re flowers!” He may have been nearly as excited as me! As soon as I started to open the box, I caught a glimpse of pink which is my favourite colour, and I knew I was going to love it. And wow, I was right. I was greeted with this stunning bouquet called Antique Elegance. Isn’t it gorgeous? The flowers were beautifully presented. Their stems were wrapped in a damp cloth and they were standing inside a black gift bag. They came with a personalised gift card, flower food, and detailed care instructions. I know I said I didn’t mind which bouquet I received, but if I’d had to choose, I honestly would have chosen this bouquet myself. It is so pretty, and has a real vintage feel to it – the selection of flowers is just sublime. Now I’m not a flower expert, so I did have to check the website for their names(! ), but this bouquet includes: pink Bouvardia, Antique Carnations, Memory Lane Roses, Avalanche Roses, Calla Lilies, white Veronica and Eucalyptus. I may not know their names but I love everything in it. The roses are probably my favourite. I carefully unwrapped them, removed the lower leaves, cut the ends at a diagonal and popped them in a vase full of fresh water and flower food. They go perfectly on our kitchen table and really brighten up the room. Oh and they smell divine! As soon as I wake up and go downstairs, the first thing I do is smell the flowers. Mmmm. I just wish they’d last forever. If you’re looking for a special Mother’s Day bouquet, then I’m sure she would be delighted with this. My Mum came to visit and she absolutely loved the bouquet and its vintage design. And Mum knows a lot more about flowers than me! It’s been a week since I had the delivery, and the flowers are still going strong. The tips of the roses are starting to turn a little but it still looks and smells gorgeous. The Antique Elegance bouquet from Haute Florist costs from £45, depending on which size you choose. If you’d like to find out more, please visit the Haute Florist website. Disclaimer: Mums Off Duty was gifted this bouquet from Haute Florist, in exchange for an honest review. All words and opinions are, of course, my own.